For on-the-go families, convenience foods can make regular appearances in snacks and meals. Have clients forego the high-fat and sodium-filled finds for these experts’ recommendations—foods that get dinner on the table quickly without sacrificing nutrition. Americans are in a hurry. They use the quickest route to get from here to there, the fastest computer, the quickest Internet connection, the most responsive gaming system. The same holds true for eating. Quick and easy are the “golden rules” of food preparation. The fastest, most simple meals are the ones that usually turn up on the table or in kids’ lunch bags. While time pressures are often the driving force behind the use of convenience foods, sometimes a lack of knowledge about food preparation plays a role as well. In an ideal world, foods should be not only quick and convenient but also nutritious and economical. So the real question is, can you have it all? The RDs interviewed for this article answered that question with a resounding yes. The term “convenience food” conjures up images of overly processed foods that are high in fat, sugar, and sodium and low in fiber and phytonutrients. Convenience food often connotes a lack of effort or concern, whether by choice or necessity. Traditionally, convenience foods have not been the most healthful choices and often have been much costlier than home-cooked fare. But it doesn’t have to be that way. The key, say dietitians who regularly counsel patients, is to replace the traditional concept of convenience foods with healthful foods that are convenient. One key to helping clients choose convenient foods that are healthful is to have them regularly read ingredient lists, says Beth Thayer, MS, RD, director of wellness programs and strategies for the Henry Ford Health System in Detroit and a spokesperson for the American Dietetic Association. The more wholesome the ingredients, she says, the better the choice. 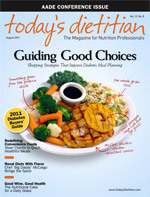 The 2010 Better Homes and Gardens Food Factor Survey revealed just how dependent today’s cooks are on convenience foods. Of 3,600 women surveyed from across the United States, 71% of them purchased convenience produce (eg, prepared salads, chopped fruits and vegetables), and 81% purchased convenient forms of fresh poultry and meats regularly. According to Health and Human Services, the quest for convenience is leading more people to consume away-from-home quick-service or restaurant meals or to buy ready-to-eat, quickly accessible meals to prepare at home. Convenience foods are being packaged to trim the time spent on shopping, preparation, cooking, and even cleanup. When the wrong choices are made, the trend contributes to obesity, especially among children. One of the primary motivations behind choosing convenience foods is to save time, and nutrition can go out the window. Karen Ansel, MS, RD, CDN, a spokesperson for the American Dietetic Association, says she always encourages clients to keep healthful, convenient foods on hand in the cupboard, refrigerator, freezer, and pantry. “Tell clients that just by having it stocked in the house, it’s saving them a last-minute trip to the store,” she says. Below is a collection of healthful yet convenient foods RDs can recommend to clients and patients that will surely help them cut down on time in the kitchen while improving their nutrient intakes. All these convenient yet healthful items can help make meals and snack times both quick and nutritious. • Brown rice: In a bag or frozen, this healthful choice takes only eight to 10 minutes to prepare compared with about 45 minutes the traditional way. • Jarred pasta sauce: Just open and heat. Recommend that clients read nutrition labels and look for a sauce that is low in sodium. Suggest adding prechopped vegetables steamed in the microwave. Pair with a whole wheat pasta and dinner is on the table in 15 minutes. • Canned broth: Point out lower-sodium versions so clients can use them for soups, stews, lentils, and beans. • Canned tomatoes: Reduced-sodium versions are available and can be added to soups, stews, casseroles, and chilis. • Canned beans: Black, pinto, navy, red, or garbanzo beans can be ready in minutes. No soaking overnight. Just open, rinse (to remove about 30% to 40% of the sodium), and spice them up or add to dishes. • Oatmeal in packets or cups: It’s portable and cooks in the microwave in minutes. Excellent for traveling—most hotel rooms have a coffee maker to heat water—or taking to the office for a midmorning snack. • High-fiber cold cereal: Not just for breakfast anymore, it works for lunch and as a nutritious snack when time is in short supply. If individual servings are not available, advise clients to create their own single servings in plastic bags or small, reusable storage containers. • High-fiber crackers: Look for crackers with only a handful of ingredients, such as whole wheat and salt. They pair well with hummus, guacamole, peanut butter, and vegetarian bean dip. • Canned tuna or salmon: Open, garnish, and eat. It’s an easy way to build on the recommendation to consume 12 oz of fish per week. • Frozen entrées: Plenty of healthful options are available today that contain whole grains and vegetables and have lower levels of fat and sodium than in the past. And there are a growing number of options for vegetarians and vegans. • Frozen veggie pizza: Although even vegetarian pizzas vary quite a bit in their nutrition content, some excellent low-sodium, low-fat options are available. Check out the nutrition labels for products in your area to find one you can recommend to clients and suggest adding more precut vegetables before popping them in the oven. • Pocket or pita bread: Simply open and stuff with lean lunch meat, low-fat cheese, avocados, and leftover vegetables, for example, or spread on peanut butter. • Individual cups of peanut butter: They contain about 21/4 oz each and go along perfectly with whole grain crackers, pitas, or prechopped celery sticks. • Individual cups of hummus: Like the individual cups of peanut butter, it’s the ultimate in convenience. High in protein, it’s good for lunch or a snack. Recommend dipping pita bread strips, carrot or celery sticks, or whole-grain crackers. • Soy nuts: Available in a variety of flavors—from barbecue to wasabi—they’re rich in high-quality protein and phytonutrients, including isoflavones. • Edamame: Frozen edamame can be toasted or stir-fried or added to any casserole, soup, or stew. • Whole wheat pasta: Most pasta is ready in about eight minutes. While whole wheat is a healthful choice, regular semolina pasta doesn’t have to be eliminated from menus. And there are newer options such as quinoa pasta, which is gluten free. • Prepackaged low-fat yogurt: Suggest one that’s lower in fat and sugar. Also suggest Greek yogurt, which is higher in protein than regular yogurts and may suppress appetite longer. • Prepackaged guacamole snack packs: Guacamole packets are great for making burritos, tacos, or topping off a prepackaged salad without the hassle of peeling, mashing, and seasoning fresh avocados. • Frozen mashed sweet potatoes: In about eight minutes, clients can have a side dish rich in beta-carotene. • Unsweetened applesauce in individual containers: These are great for packing in lunches or as a quick on-the-go snack. All that’s needed is a spoon. • Trail mix: Not all trail mixes are created equal; some are clearly high in fat, sodium, and calories. Help clients choose the most healthful options, combined with lessons on portion control. Suggest adding to applesauce, yogurt, and low-fat pudding. • Snack bars: There are dozens of snack bars to choose from in hundreds of flavors. It’s a matter of finding ones that you feel comfortable recommending and that will satisfy the tastes of a wide variety of clients. Look for ones that are high in fiber and low in fat and sodium. And add to your recommended list vegetarian and vegan options as well as gluten-, dairy-, and nut-free choices. • Frozen veggie burgers: These are premade, preshaped, and ready to be placed on a whole wheat bun. In minutes, they can be microwaved or quickly pan-cooked with a little olive oil. • String cheese: Often thought of as a kids’ snack, it’s convenient and nutritious for adults, too. • Whole wheat couscous: Ready in just five minutes, it offers a serving of whole grains and can be tossed with any steamed vegetable or canned peas or beans. • Popcorn: Advise clients on how to choose a low-fat, low-sodium variety. After they pop it in microwave for about 31/2 minutes, they can have a nutritious, high-fiber snack. Opt for individually bagged servings and cooking time is even less. • Precooked quinoa in a pouch: This convenience food is ready in about eight minutes. Add garbanzo beans, chopped nuts, or dried fruit. Some convenience foods are not processed; they’re merely preprepared or simply easy to use. They’re back-to-basics nutritious time-savers. • Eggs: Boil them or crack them open and scramble or make a quick omelet or frittata with precut vegetables. According the Egg Nutrition Center, the best way to prepare a boiled egg is not to boil it at all. The center advises putting the eggs in water and just bringing to a boil, turning off the heat, and keeping them in the covered pot for 15 minutes. Then cool them in ice water. • Fresh fruit: Apples, bananas, plums, pears, grapes, oranges, nectarines, and apricots are portable and ready to eat. Peel fruits such as oranges and nectarines at home and store in a plastic bag to avoid the mess at work or school. And prepackaged as snacks alone or with peanut butter, sliced apples are the ultimate in convenience, especially for kids’ lunches or after-school snacks. • Carrot and celery strips: You can buy them already cut, but you can save money if you precut them yourself (when you have the time), store in the refrigerator in containers, and take as needed. • Dried fruit: Cranberries, cherries, blueberries, and mangoes are great additions to low-fat yogurt, oatmeal, cold cereal, or low-fat pudding. • Single dried plums: Each dried plum (formerly known as a prune) is individually wrapped so it stays moist. Drop them into a lunch bag or a purse for no muss, no fuss, high-antioxidant nutrition. • Cherry tomatoes: They’re naturally bite-sized and there’s no mess. Advise clients to leave them out on the table or pack in a lunch to eat like grapes. • Bag of baby carrots: They’re already peeled, they’re bite-sized, and they’re ready for quick cooking in the microwave or for snacking with low-fat dressing. • Rotisserie chicken: It’s precooked and prepackaged, infused with a variety of flavors, and often still warm in the grocery store. Clients can bring it home and serve it with a vegetable side dish and a whole grain rice. • Bagged spinach: Remind clients that they should still wash it, but it won’t take as long as fresh to remove whatever grit might be left. • Fresh pasta: Found in the refrigerated section, it doesn’t take less time to cook than dried pasta, but it’s certainly quicker than if made from scratch. • Premade packaged whole wheat pizza crust: The most time-consuming part about making pizza is the crust. Simply add tomato sauce, preshredded cheese, and precut vegetables, and a convenient, healthful pizza is ready for the oven. • Prechopped onions, celery, and carrots: Sometimes available in combinations, they are ready to be added to soups and stews, making the prospect of preparing dinner less daunting. • Deli turkey slices: Not just turkey but any lean deli meat—roast beef, ham, chicken breast—that’s sliced at the counter made to order so there’s no waste is a convenient choice for snacking or for packing lunches. • Shredded, crumbled, or cubed cheese: Available in blends or individual cheddar or Monterey Jack, for example, it saves time spent grating or cubing. The cubed cheese is great for snacks, and it has the advantage of built-in portion control. • Nuts: Roasted peanuts, pecans, cashews, pistachios, macadamias, and Brazil nuts are portable, nutritious, and, on a per-serving basis, very affordable. But remind clients not to go overboard with Brazil nuts; they’re extremely high in selenium. One or two mixed with other nuts is enough. • Precooked shrimp: They’re ready to go for use in prebagged salads or tacos or dipping in cocktail sauce. • Clients shouldn’t feel the need to apologize for using convenience foods such as frozen entrées. Many are more healthful than dishes they would typically make at home. • Suggest having a grill pan handy. It’s quick, it reduces the fat left in the dish, and cleanup is easier than with two-sided grill pans. They range in price from about $11 to $100. • For the ultimate in convenience, if it’s in the budget, truly time-pressed clients can opt for delivery services that prepare nutritious meals and deliver them to the door. • Clients can join a cooking co-op, where classes are held so everyone cooks meals in advance and takes them home to have nutritious meals to freeze or refrigerate. • Recommend joining an organic co-op, in which the cost of organic produce and other organic food items are shared and members either pick up the week’s or month’s produce or it is delivered to their door.